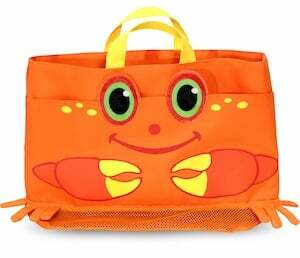 The Melissa & Doug Kids Crab Beach Tote Bag has exterior pockets and a roomy interior to pack everything you need for an adventurous day at the beach. This kid tote bag is generously sized with a super-bright, red-orange design that also has mesh panels in the bottom so you can "sift" out the sand! Beach bags have never been so fun!